Everyone in Kentucky deserves a safe, healthy, secure home. With the help of allies in the Healthy Homes Coalition of Kentucky, a bill that has grown from KFTC’s Southern Kentucky Chapter’s work for safe, healthy housing has cleared a hurdle, and is gaining momentum. 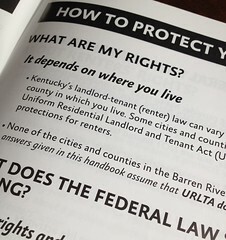 The Uniform Residential Landlord Tenant Act (URLTA) is a set of protections and best practices for renters and landlords. In Kentucky, communities can opt in to URLTA. Several counties or communities have, including Louisville, Lexington, and some communities in Northern Kentucky. But Kentuckians in 116 counties do not have access to these protections and stability provided by URLTA. HB 380, sponsored by Rep. Glenn, would make URLTA apply statewide. HB 380 passed out of the Kentucky House of Representatives! It now moves to the Senate. Let’s keep building momentum! Call the Legislative Message Line at 800-372-7181 and leave a message for your Senator and Senate Leadership. Message: Renters in every Kentucky community deserve the same protections for a safe, healthy home. Please support HB 380.